viewGoal(Req) displays a graphical view of a tuning goal or vector of tuning goals, specified as TuningGoal objects. The form of the tuning-goal plot depends on the specific tuning goals you use. Plots for time-domain tuning goals typically show the target time-domain response specified in the tuning goal. 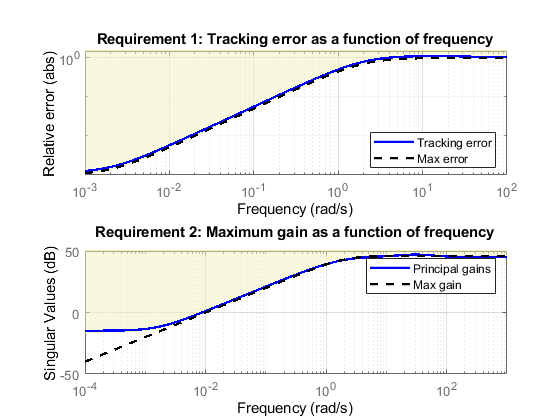 Plots for frequency-domain tuning goals typically show a shaded area that represents the region in which the tuning goal is violated. When you provide a vector of tuning goals, viewGoal plots each tuning goal on separate axes in a single figure window. viewGoal(Req,T) plots the performance of a tuned control system against the tuning goal or goals. The form of the tuning-goal plot depends on the specific tuning goals you use. Typically, the plot shows both the target response specified in the tuning goal and the corresponding response of the control system represented by T. For more information about interpreting tuning-goal plots, see Visualize Tuning Goals. Create a tuning goal that constrains the response from a signal 'd' to another signal 'y' to roll off at 20 dB/decade at frequencies greater than 1. The tuning goal also imposes disturbance rejection (maximum gain of 1) in the frequency range [0,1]. When you use a frequency response data (frd) model to sketch the bounds of a gain constraint or loop shape, the tuning goal interpolates the constraint. This interpolation converts the constraint to a smooth function of frequency. Examine the interpolated gain constraint using viewGoal. The dotted line shows the gain profile specified in the tuning goal. The shaded region represents gain values that violate the tuning requirement. For more information about interpreting tuning-goal plots, see Visualize Tuning Goals. Examine the tuned response of a control system against tuning goals, to determine where and by how much the tuning goals are violated. This visualization helps you determine whether the tuned control system comes satisfactorily close to meeting your soft requirements. 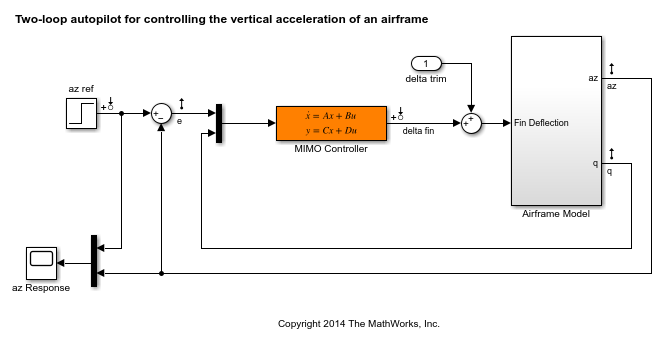 Open a Simulink® model of a control system to tune. Create tuning goals. 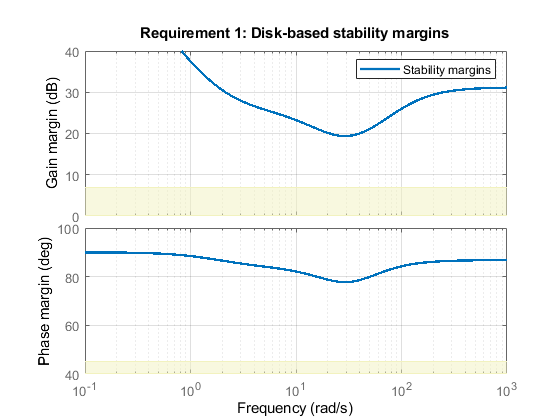 For this example, use tracking, roll-off, stability margin, and disturbance-rejection tuning goals. Create an slTuner interface, and tune the model with these tuning goals designated as soft goals. Verify that the tuned system satisfies the margin requirement. The shaded region corresponds to margins falling short of the target of 7 dB gain margin and 45 degrees phase margin. The solid line shows that the margin requirement is satisfied at all frequencies. Examine system responses compared to the tracking and disturbance-rejection tuning goals. When you provide a vector of tuning goals, viewGoal plots them on separate axes in a single figure. The first plot shows that the tuned system response very nearly satisfies the tracking requirement. The slight violation suggests that setpoint tracking will perform close to expectations. The second plot shows that the gain requirement is satisfied except at low frequency. 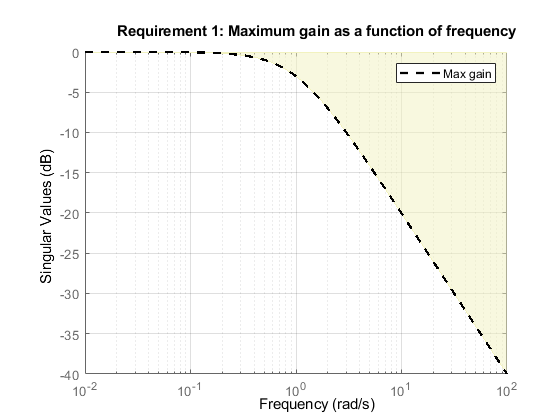 For this tuning goal, the shaded region, which represents the effective tuning constraint, diverges from the specified maximum gain profile at low frequency. This modification to the gain profile is to avoid a pole at s = 0 in the weighting function used to normalize the goal (see Tips on this page). While the tuned gain exceeds the specified gain below 0.001 rad/s, it is still about 60 dB less than the peak value, which is typically enough in practice. 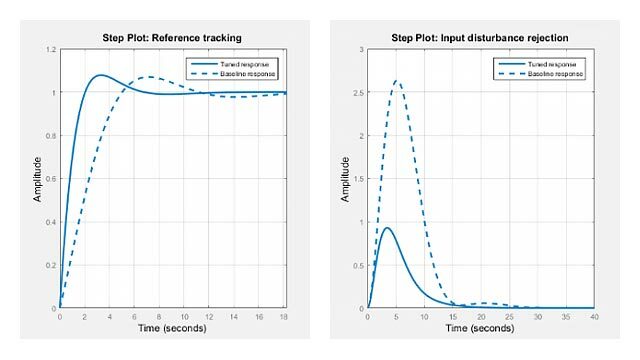 To further examine the responses of the tuned system, use getIOTransfer to extract the relevant transfer functions for analysis with time-domain commands such as step. Tuning goal to view or validate, specified as a TuningGoal object or vector of TuningGoal objects. For a list of all TuningGoal objects, see Tuning Goals. For general information about how to interpret tuning-goal plots, see Visualize Tuning Goals. For information about interpreting margin-goal plots in particular, see Stability Margins in Control System Tuning. For varying tuning goals that you create with varyingGoal, the tuning-goal plot generated by viewGoal lets you examine the tuning goal at each design point. For more information, see Validate Gain-Scheduled Control Systems. You tune a control system in discrete time, but specify the gain profile in continuous time. The software modifies the asymptotes of the specified gain profile to improve numeric stability. For more information about how an enforced tuning goal might differ from the goal, see Visualize Tuning Goals. For MIMO feedback loops, the LoopShape, MinLoopGain, MaxLoopGain, Margins, Sensitivity, and Rejection goals are sensitive to the relative scaling of each SISO loop. systune tries to balance the overall loop-transfer matrix while enforcing such goals. The optimal loop scaling is stored in the tuned closed-loop model or slTuner interface T returned by systune. For consistency, viewGoal(R,T) takes this scaling into account, and plots the scaled open-loop response or sensitivity. To omit this scaling, use viewGoal(R,clearTuningInfo(T)).